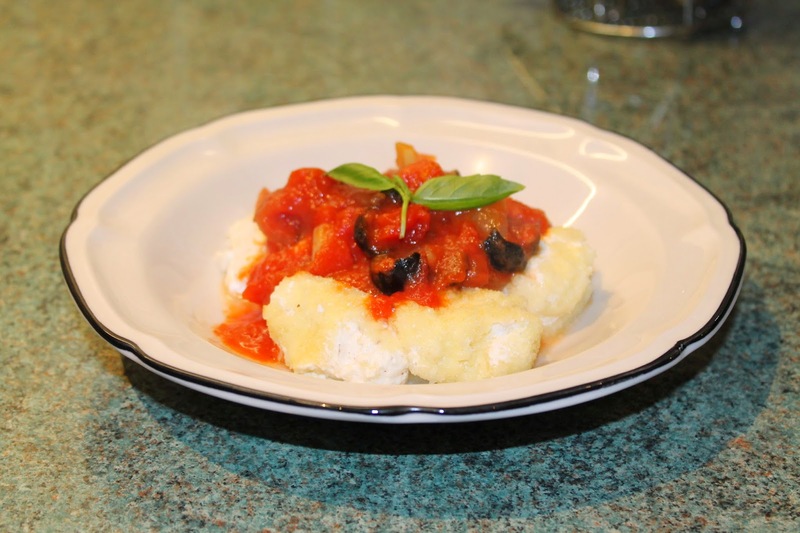 I watched Jamie Oliver do a recipe for Gnudi on his Comfort Food series; before this I’d never heard of it before and I liked what I saw – it sounded delicious and so we’ve tried it as soon as possible. Gnudi are essentially balls of ricotta which have been covered in semolina – the semolina dries out the ricotta to form a crust around the outside, which then makes the balls strong enough to withstand cooking in boiling water. They’re a little tricky to make – you have to leave them for a long time, so I made mine last night ready to cook this evening, and they are quite delicate so you must be careful when cooking them. But you will be rewarded; they are scrummy! Jamie served his Gnudi with a sage butter, which sounds gorgeous, but I decided to inject a bit of 5-a-day into mine and tried to make it a little healthier for a mid-week meal. Serve with crusty bread on the side, and enjoy! This will serve 4, and takes 15 minutes each evening plus the time in the fridge. 1. In a bowl, mix the ricotta, parmesan and nutmeg well. 2. Take a tray and cover with a layer of the semolina. With your hands, form the ricotta into small balls about 1.5 inches wide, roll in a plate of semolina and place on the tray. Sprinkle over more semolina when you have finished; you want to make sure each ball has been covered well. Place in the fridge overnight. 3. To make the sauce, chop the onion and place in a saute pan with the olive oil. Cook on a medium heat for 2 minutes, then add the anchovy fillets and olives. Crush the olives with your wooden spoon, and continue cooking until the anchovy fillets have almost disintegrated. 4. Tip in the tomatoes, simmer for 5 minutes, then season and stir in the chopped basil. 5. To cook the gnudi, bring a large pan of water to the boil. Gently place the gnudi in the water (it is best to cook them in small batches) and boil for 3 minutes. Remove with a slotted spoon. 6. Layer gnudi in each person’s bowl and pour over the sauce. Bellissimo!